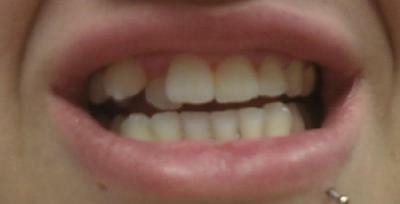 My question is: I have a severe gap in my top front teeth and behind the gap a tooth sits back a little bit. I have gotten many different opinions on what to do to fix my teeth. I've heard: "Get your wisdom teeth out, let your teeth shift then get Invisalign", "Have the tooth that sits back pulled and get an implant", "Get the tooth that sits back pulled and get a bridge". I've heard so many different things I'm just not sure which one to do because I don't want it to be the wrong choice. Please help! Thank you for your question about braces for teeth. What I can see from your photo, is that one the second front teeth on your right upper jaw (the right lateral) is inverted, which means that the lower incisor on your right side will ”lock” this tooth, that is, that you bite with this lower tooth over the upper tooth, when normal is the opposite way. Your teeth are also a little bit crowded, which means that you have some lack of space in your tooth arch. Well, removing your wisdom teeth will not affect your front teeth. There is a lot of controversy about whether wisdom teeth cause frontal crowding, but so far science cannot support that they do. So if you do not need to remove your wisdom teeth due to other reasons (caries, resorption etc) just leave them. I am not sure why some people suggest your get an implant. The photo gives only information about the external parts of your teeth. I would not recommend you to extract the tooth and get an implant or a bridge. To have one’s natural teeth is the very best thing. Theremore, to have braces is no bad idea. This way you can keep your own teeth! They last much longer than a brigde or an implant, and they have a better estethic and are functional, alive elements in the tooth arch. Anyway, before getting braces you should have your jaw relation and your teeth thoroughly examined, both clinically and x-rayed. Good luck with your braces for teeth!